Get your pans oiled and your knives sharpened, because another harvest season is upon us. Deliveries will begin next week—a week earlier than scheduled! Luscious greens, fragrant herbs, garlic, strawberries and more will make a short trip down I-71 to rendezvous with you. First Wednesday pick-up will be May 16 and first Saturday will be May 19. Shares are still not filled up for the year, so we will still happily accept new members after the season starts. Thanks for spreading the word. Your very own CSA farmer was among the farmer-authors published in Greenhorns: 50 Dispatches from the New Farmers Movement. Many of you would recognize “The Ambush” as the story of my discovery of our massacred flock of chickens in November of 2010, when Courtney was 41 weeks pregnant. The various samplings of young farmers’ stories from around the country offer rich glimpses of why we are farming and what challenges we face. The proud and humble voices in this book are encouraging about the future of agriculture. One of our hens became the proud new mama of seven this past Sunday. Nature is beautiful. 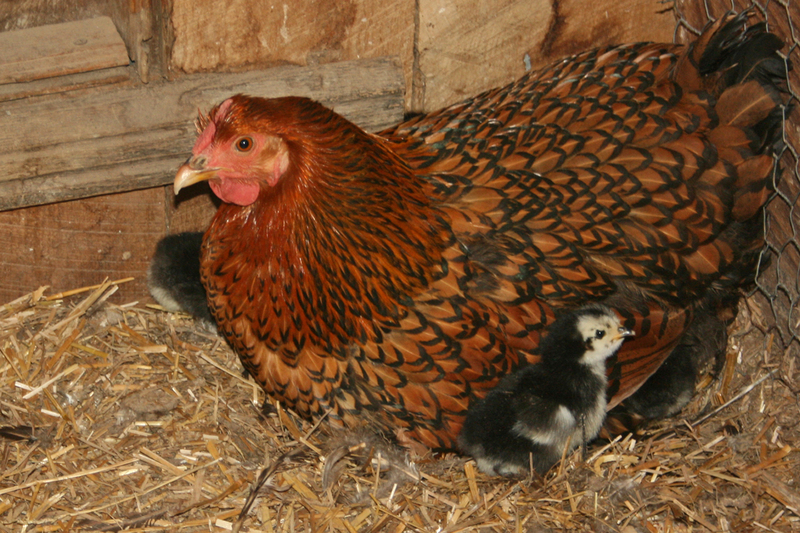 She, like every hen (that has ever been allowed to hatch eggs) before her, hardly moved for 21 days. Stoic and patient, there she sat every day, seemingly watching the world go by. Sunday morning she was still there, but in the afternoon there was a family where there once was none. And she now has the ineffably precious gift of life cheeping beneath her, something spectacular to show for her three weeks of sitting. May is a mad month on most farms like this one. Brief planting windows open and close too quickly. Planting is clearly critical, for if you don’t plant it, it certainly won’t come. But meanwhile weeds are gaining speed as the days lengthen. When harvest begins, you should be in three places at the same time. May is full of manic movement on the produce farm. Here at A Place on Earth, Courtney is still in school, and the moment she gets home in the afternoon I need to hurry and make hay while the sun shines. It’s a whirlwind, and it won’t let go til Fall. Next week we will start sharing the results of nurturing this earth with work and love. We look forward to being a source of deep nourishment. 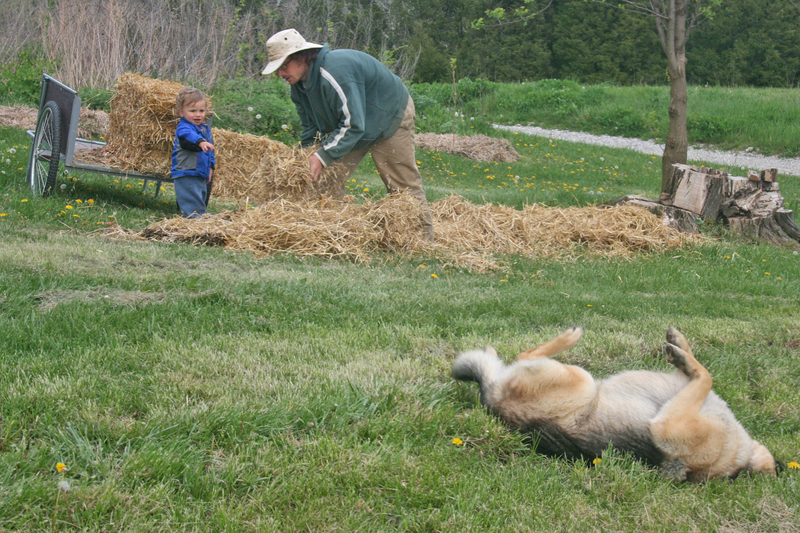 Spring is barreling along at A Place on Earth Farm. After a very mild Winter, Spring began as if Summer, with sweaty highs in the 80s during March. As you have surely noticed, Nature is way ahead of itself this year. We’re trying to keep up with the tide here: a swelling greenhouse population, crops and weeds alike springing up in the fields, strawberries blossoming, peas climbing, etc. April has delivered more typical, lovely Spring weather. It is a beautiful and hopeful time of year, barely conceivable potential stretching to the horizon. We greet the usual Spring suspects anew, hopefully humbler and wiser than before. The big new development for the farm this year is starting an internship program. Ronnie Hager and Lori Beard moved onto the farm a few weeks ago. They bought themselves a comfortable camper, and we bought solar panels and batteries to provide their electricity. Having their help here has already revolutionized the farm. With their work in addition to our steadfast working shares, we are off to a great start keeping up with what needs to be done. I find myself wondering how we made it through last year, with a newborn, a new teacher, and the customary list of demanding jobs. With Ronnie and Lori here, we have a couple new projects in the works: this past weekend we became the new home for two hives of honeybees; this Summer we will be raising chickens for meat. We’ll keep you updated on their progress, and let us know if you are interested in either of these crops. After four years living on and learning from this farm, I finally felt confident enough to make the plunge this year and set out some 50 fruit trees: pears, peaches, apricots, plums, cherries. The harvests which may or may not come are of course years off, but, in quiet moments digging, I can almost taste the luscious rewards. We’ve also planted asparagus this Spring and added to our blueberry, raspberry and strawberry crops. Clark is a happy, busy boy, bent on being outside at all times, exploring, toddling, at times tumbling, full of sweetness and light. His vocabulary is growing faster than we can comprehend what he is saying. He has his own little garden tool set and really wants to be helping, although you better keep your eyes on him, because he is not quite trained as to the difference between vegetable and weed. We’re looking forward to him being more and more actively involved in farm life. Courtney is finishing up her second year teaching Spanish at Henry County High School. As many of you know, it is a challenging job—not unlike farming in its more-than-full-time demands—and this year has been even harder as she has been in the grips of the KTIP program, which is basically a lot of paperwork and being frequently observed by school administrators. Congratulations to Courtney for balancing being a great teacher, wife, and mother. We are still needing to sign up more CSA shares. We are well under our budgeted goal and not even up to as many shares as we had last year. Your continued support is greatly appreciated, and anything you can do to encourage others to participate and keep this farm prospering would be very beneficial. We will be back at the Amazing Green Planet in Westport Village on Saturday, May 12, with a wide variety of vegetable and flower plants. Hopefully this year the weather will cooperate, and hopefully we’ll see you there. Because everything is running ahead of schedule, we may begin deliveries earlier than planned. We’ll keep you posted as we head into May. We hope you are enjoying this beautiful Spring. We’re looking forward to seeing you next month and sharing the wealth! You are currently browsing the A Place on Earth Csa Blog blog archives for May, 2012.